Running a live guest, 20150422 15.04 image. Cannot shutdown/restart using normal procedure/menu item. Must hard power off the guest. Does not affect kvm/qemu or bare metal. Just tested this with Wily Daily ISO for July 3, 2015 and can confirm it still is occurring. Tested with the Ubuntu MATE 15.10 daily ISO for August 29th, and it doesn't appear fixed, or at least it shows a shutdown job with "unlimited". I waited a couple of minutes then just closed the VB guest. How long did you have to wait for it to finally shut down, or did it shut down really quickly? No, this won't show in KVM; only with VirtualBox or VMWare. Is anyone else seeing this report from comment #9 about a job waiting to be terminated, but with an 'unlimited' limit? Otherwise, this would seem to be an issue with the caching when we stop the image, still -- we must still be missing some small things for it to work correctly on VBox and VMware. 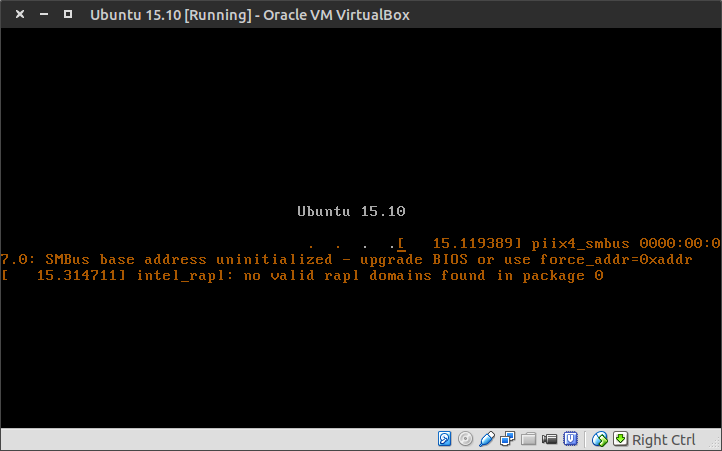 I am repeatedly seeing #10 with virtualbox. This bug is still present in Xenial. I am finding this to be present in Xenial as of the 20151231 daily ISOs. mathieu-tl: In comment #12, what exactly are you looking for? I'm working on improving this bug report. I was expecting confirmation of my thoughts about that job waiting to end; we got that from flocculant. There isn't anything missing for this but careful debugging on the shutdown processes. Ideally it would have to be reproduced with the splash disabled, so we can see as much information as possible, possibly attaching a serial console to the VM so that debug messages from plymouth and/or systemd can be written there, hopefully something will pop up. Changing the Virtualbox settings and the kernel command line to output to a text file on the host machine (see https://www.virtualbox.org/wiki/Serial_redirect) worked to get a log file, but caused the "Please remove the installation medium, then press ENTER:" screen as well as a text-mode animation to show up. Pressing enter did not cause the system to shut itself down though. The text-mode shutdown animation continued to display along with the "Please remove the installation medium, then press ENTER:" message. Due to the fact that the issue changes whenever logging is set up, it will likely be difficult to debug this issue fully. Just a reminder that someone will need to add this to Xenial's Release Notes, too. One of the comments on the Ubuntu MATE 16.04 Alpha 1 tracker suggests the KVM is also affected. Can someone confirm? According to systemd debug-shell the stuck job, is casper-stop waiting on "plymouth watch-keystroke", see attached screenshot. 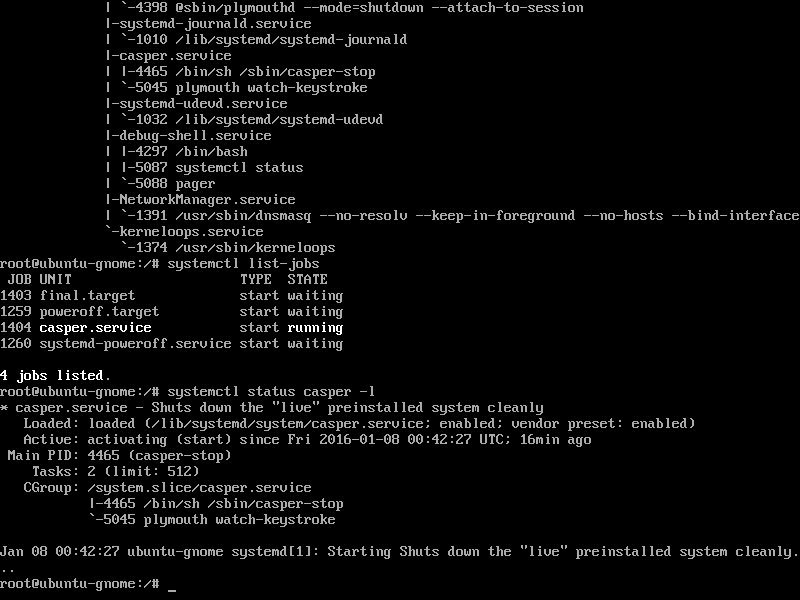 Atleast on VMware the plymouth shutdown splash is not being displayed, so I guess keystrokes never make it to plymouth. I used Xubuntu xenial-desktop-amd64.iso on 20160113 and in VirtualBox PLEU 5.0.12 r104815 and the installer still gets hung after it has ejected the ISO. I know it ejects as VirtualBox flips back from having the ISO mounted to the drive being empty. Should not it then get to some message about pressing any key to restart? Pressing keys did nothing to cause a restart of the VM. I used VirtualBox's hard reset and the VM boots up just fine. Does not look completely fixed to me. I did some testing on this bug. Due to some issues between me and the cdimage server, I ran the 20160129 image of Lubuntu Desktop in my QA testing VM, on my VMware Workstation Pro 12 environments (both 32bit and 64bit). There is indeed a "won't shutdown" issue, but I think it's related to the prompt that shows up on the other already-released ISOs for the main releases - it asks for the user to hit "Enter" to reboot after ejecting or removing installation media. This does not display, though, so it looks like a "won't shutdown ever" issue. Given that I remembered this, though, in a test to see if this was the issue, I hit "Enter" at the blinking cursor I see when running this in VMware, when it appears to not "shut down". This allows the system to shut down as it should, and hitting "Enter" then has the guest "live" session shut off as it should. I think, then, that with the images, it may be a case that it is waiting for the response to this prompt, hence the "Unlimited" task of waiting for user input. As referenced to in comment 25 here, the waiting for the enter keystroke is what is hanging it up, and the splash screens not showing up to show this is the main issue. I have also followed this up and installed the latest virtual-box as advertised which is Version 5.0.14 r105127 as if it were solved on that, we would have enough time to get it into the LTS. Sadly, when pressing enter / return the session is still showing as running. Testing Ubuntu GNOME 16.04 Beta 1 20160225.1 (amd64) and this bug is alive and doing well. > alive and doing well. > using normal procedure/menu item. Must hard power off the guest. Boot with "systemd.debug-shell plymouth:debug" added as kernel params then when it hangs switch to VT9. You will probably need to manually remount a partition/usb to get the logs out, since you will be quite late in the shutdown cycle. I can't reproduce on my laptop, though I did poke around previously in a VM. vbox was I recall having drm issues, vmware just seemed racy (it worked maybe 1/5 reboots). Tim you can also edit the kernel command line to output the logs through a serial port if you have the equipment to receive the logs afterwards. @ darkxst - Tried to grab these logs from running the debugs - not managed so far. That said, originally I misread your 'added' and removed quiet splash and just put the debug commands - without quiet and splash - I get the 'Remove media and press Enter' - doing so - does as expected. flocculant, if you remove "splash" plymouth gets disabled and the casper code will fallback to console i/o. yea - realised that a bit later - can't edit comments - anyway - still not able to grab the logs though. you couldnt get to VT9 or just unable to export logs? Not able to get to vt9. Can only get to vt1. Not seemingly able to do much other than read it in the vt. However by grepping the log at vt9 against the one I got from inside the booted system - the last line is exactly the same. Not having much luck with journalctl - got the one from the livesession as a paste, trying to grab the output from vt9 is problematic - would be simple if I could get networking there ... all I've managed is a bunch of screenshots of the extra journalctl output. Just saw two variations of this with Ubuntu Studio amd64 and Virtual Box on two different sets of host hardware (desktop and laptop). Reached the end of the full installation, and got the "Installation complete - you need to restart" dialogue. Clicked to restart and the VM froze with the dialogue showing that I had clicked the button for at least half an hour. Walked away, and when I came back, the VM had booted into the installed Ubuntu Studio. So a pass, but frustratingly slow. Reached the end of the full installation, and got the "Installation complete - you need to restart" dialogue. Clicked to restart and the VM slowly removed icons, then went to a blank screen, and hung for at least half an hour. 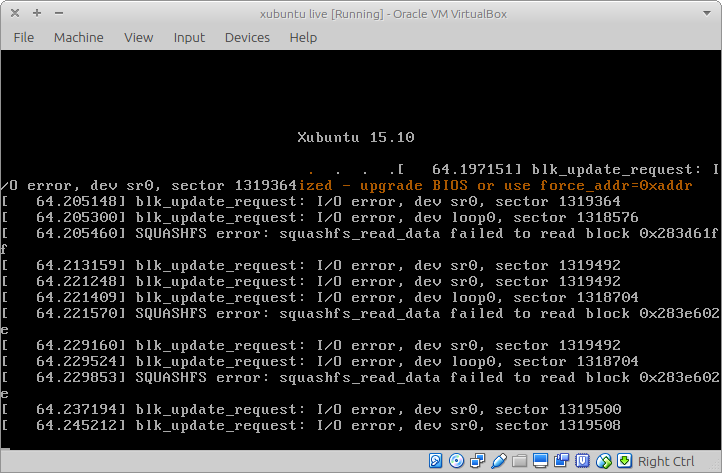 Walked away, and when I came back, the VM had booted into the live Ubuntu Studio installation ISO again. Chose shutdown from the menu, and I am still waiting for the machine to shutdown 20 minutes later. I did some testing today with Lubuntu Xenial i386 in two real computers, and it seems that live systems booted from cloned drives do not shutdown correctly, but grub-n-iso systems are not affected by this bug. Could it be that this bug is actually the same as that one? An ISO image used by VirtualBox has the same content as a USB drive created by cloning (from the ISO image file). are those images created with grub-n-iso persistent USB's? that will create differences in timing etc especially on 2nd and later boots. Atleast on vmware this issue seems to be a race issue in the systemd units. I don't think syslinux vs grub should make any difference, I see the same issue on an installed system under Vmware. It just doesnt hang there, since there is no prompt asking for user input. This bug is alive for Ubuntu 16.04 GA. Any schedule to fix it ? This bug is alive for Ubuntu 16.04.1 Desktop. This issue is alive for ubuntu-gnome-16.10-beta1-desktop-amd64.iso when install in ESXi 6.0GA / 6.5RC. This issue is alive for ubuntu-17.04-desktop64 dailybuild 7-Mar-2017 when check in ESXi6.6. I hit the similar issue as described in #44 in Canonical Ubuntu 15.10, Ubuntu 16.04, Ubuntu 16.10, Ubuntu 17.04 when check in ESXi6.0 GA, ESXi 6.5GA, ESXi 6.6.